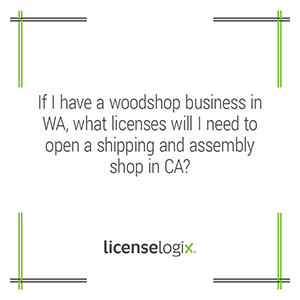 I presume your wood shop is registered as an LLC or Corporation with the WA Secretary of State. The company will likely need to register with the CA Secretary of State as a foreign entity. This is required if a company is regularly “transacting business” in California. A physical location in CA is generally considered to meet that threshold. You may need to obtain a California sellers permit depending on whether the CA location will be "selling merchandise or other tangible personal property in California." Your business may also need to obtain a local business license for the city or county that the CA shop will be located. Contact us now to get started.